Hangtown Fry could possibly be the first California cuisine. It consists of fried breaded oysters, eggs, and fried bacon, cooked together like an omelet. In the gold-mining camps of the late 1800s, Hangtown Fry was a one-skillet meal for hungry miners who struck it rich and had plenty of gold to spend. Live oysters would be brought to the gold fields in barrels of sea water after being gathered in and around San Francisco Bay. Such a meal cost approximately $6.00, a fortune in those days. However it came to be, ordering a Hangtown Fry became a mark of prosperity for gold-rich miners, the status symbol of the day. The recipe swept the entire Northwest Territory, from California to Seattle, in a mid-1800s. A few drinks and a Hangtown Fry were considered a gentleman’s evening. Legend has it that the Hangtown Fry originated in the saloon of the El Dorado Hotel, now the site of the Cary House Hotel, across the street from the Hangman’s Tree. The El Dorado Hotel burned down in one of the great fires of 1856 that leveled most of Hangtown, which by that time had become a growing Gold Rush city named Placerville. On the side of the El Dorado Hotel, the large brick Cary House Hotel was built where it still stands to this day on Placerville’s Main Street. It is interesting to note that some say the owner of the Gary House recovered enough gold from under the building to pay for the cost of restoration. The prospector said, “Scramble me up a whole mess of eggs and oysters, throw in some bacon, and serve ’em up. I’m starving. I’ve been living on nothing much more than canned beans since I got to California, and at last I can afford a real meal.” The cook did just that, cooking up a full plate of the mixture. Thus the Hangtown Fry was invented. In the eighteen hundreds San Francisco was quite a town. The Barbary Coast which was a section of saloons and houses of prostitution, was know the world over as second only to similary areas in Rio and Hong Kong . . . In 1853, a man named Parker opened a saloon called Parker’s Bank Exchange in the Montgomery Block. a famous building built by General Halleck. Parker invented and served a dish called Hangtown Fry. Its fame spread all over San Francisco and the surrounding areas. A few drinks and a Hangtown Fry was and is considered a gentleman’s evening . . . Today the real Hangtwon Fry is no longer to be found in San Francisco or anywhere else. It still is on the menus but when you get it you get nothing buy an egg omelet with oysters and a couple of pieces of bacon across the top. The real Hangtown Fry is too slow to make and too expensive for our modern day restaurants. This recipe has been adapted from the Blue Bell Cafe (no longer in business) which was on Placerville’s Main Street made this version of the Hangtown Fry for many years. Learn how to How To Shuck Oysters. Pat the shucked oysters dry with paper towels to remove moisture. In a small bowl, beat egg with the milk or cream. Dip the oysters in the egg/milk mixture and then the Breading Mixture. In a frying pan, heat the vegetable oil or butter. 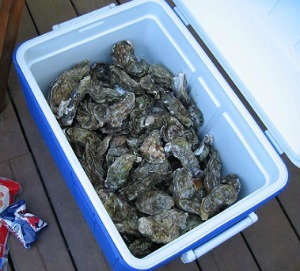 Add the oysters and fry approximately 30 seconds on each side or until three-fourths (3/4) cooked. Remove from heat and set aside. While frying the oysters, fry the bacon in another skillet until just before the bacon becomes crisp. In a small bowl, beat the eggs lightly; set aside. Place the bacon (like railroad tracks off-center) in a large frying pan over low heat. Pour a small amount of the beaten egg over the top of the bacon. 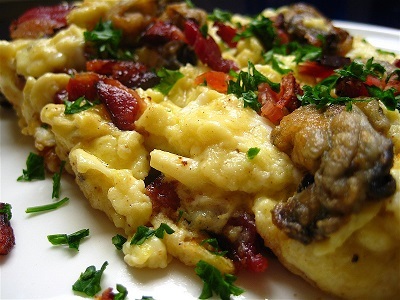 Place the partially cooked oysters on top of the bacon and then pour the remaining beaten eggs over the top. Cook approximately 2 minutes or until the eggs are set (eggs are done when creamy, soft and a bit runny; do not overcook). Then fold the omelets over the oysters. Place a lid over it and cook just until the steam blends together all the flavors. This recipe is from the February 1975 Gourmet Magazine. Shuck the oyster and pat them dry with paper towels. In a small bowl, beat eggs and cream together. In a 7-inch skillet, saute the oysters in bacon fat over moderate heat for 1 minute. Add eggs/cream mixture, salt, and pepper to taste. Cook the mixture over moderate heat for 2 minutes or until the eggs are set. Remove from heat and invert the mixture onto a heated plate and serve it with crisply fried bacon. Bull Cook and Authentic Historical Recipes and Practices, by George Leonard Herter and Berthe E. Herter, published by Herter’s Inc., 1960. City of Placerville, City History. The Origin of the Hangtown Fry, by Doug Noble, Mountain Democrat newspaper, July 31, 2000. “Could be the first California cuisine?” I would say the food of the displaced tribal people would have that honor. MY stepmom used to make a mock hangtown fry by using Chicken livers in stead of oysters. It was goo!. A friend is going to be opening a restaurant and wanted oginal recipes from that era. Can you help?